Coffee – tulen loobin su katusele kive! I love coffee. I drink a lot of it. I used to not care much about different coffee beans if the result tasted good. For years I bought pre-ground coffee and stuck to only a couple of certain names/types that I knew I liked the taste of. It was quite boring, but hey coffee was coffee and I still liked drinking it. 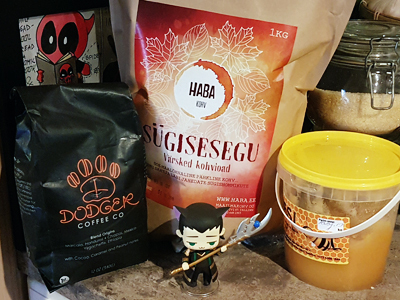 After I decided to work as a barista again, I jumped head first into the coffee world and oh boy had it changed since the last time I properly paid any attention. Suddenly there were so many ways to brew coffee and countless small roasteries with different types of beans that tasted completely different. I mean, for a long time my understanding was that coffee either tasted good or bad, but then suddenly I found myself dropped into a world of different and often amazing flavour nuances. This all culminated in buying a proper burr grinder, so I could buy different beans and try them out at home. So, join me on my journey of discovering coffee and it’s many many flavours.